It’s become kind of a “thing” for me to post a list of gardening “to-do’s” & other chores at the beginning of each month. April is especially important since spring seems to have finally arrive, and as the ground thaws we can really get after our outdoor chores. That said I’ve put together a list of I’m trying to do this month, which is pretty much last April's list with a few things taken out and a few things added. If you’ve had a vegetable garden all along maybe try some new configurations. Pinterest is loaded with “garden plans”. Select locations for new vegetable or flower gardens. Choose planting areas based on exposure to sun, shade, wind, and distance from water source. 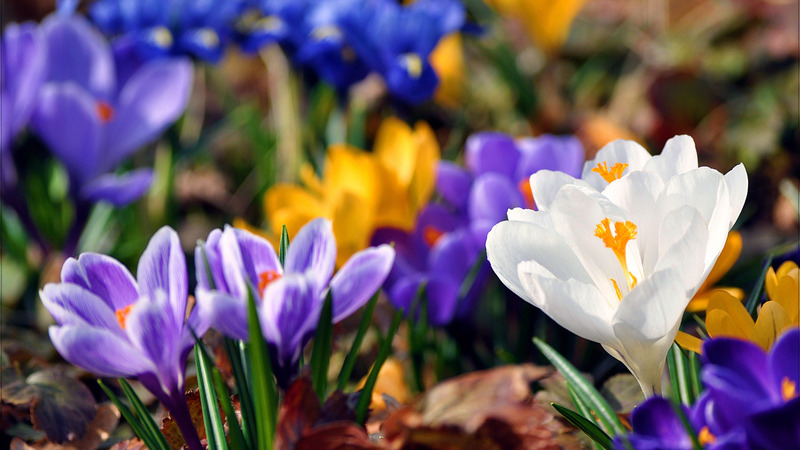 Fill holes in your gardens with summer blooming bulbs. Continue to remove winter mulch from beds. Quick note here, be sure to keep an eye on the weather as a couple of really hard frosts can still damage tender perennials. Click here for “last frost” dates in your area. Be careful about adding organic mulch until the soil warms a bit, but be sure to get it on before weeds have a chance to get established. Dig beds and add compost in preparation for plantings. Weed, weed, and weed! The more weeding you do now before they get established the better off you’ll be later. If you have roses, remove the mounded dirt, leaves, or whatever you used to protect them from the cold. If you’re planning to plant roses, whether bare root or potted, be sure to soak them overnight in Authentic Haven Brand Natural Conditioner Tea Brew Soil. This product is fantastic! Use it for healthier plants with bigger more intense blooms. Start getting your lawnmower ready. Clean the “deck” sharpen the blades, change the oil (I like to change out the gas as well), and get it all cleaned up for a season of mowing. If you feel your lawn needs a “weed-and-feed” wait for the forsythia to bloom and have at it. I always recommend using organics here, but be sure to ask your local lawn and garden what would be best. Plant deciduous & evergreen trees and shrubs. You can start to direct sow hardy annuals. I stress hardy because there will likely be a few more frosts on tap. Plant out seedlings of cauliflower, cabbage, and broccoli in the vegetable garden, and cool season annuals like pansies and snapdragons in flower beds. Plant and transplant perennials and roses. Re-seed bare lawn areas. Quick note, if you’re using a “weed-and-feed” as stated above be careful to wait at least 2-3 weeks after apply it to plant grass seed. Most weed-and-feed contains a pre-emergent that will not allow your seed to germinate. Prune out all dead, diseased, and crossing branches. Those crossing branches I call “suckers” will steal energy from branches and buds that deserve it. Complete rose pruning, if you haven’t already. Prune late blooming shrubs and trees now, but wait until after blooms drop on early bloomers. So there you have it, my April gardening tips & chores. Keep in mind these are basic tips and chores, and you should always be looking for ways to stay on track to make your life easier in the garden. I know many of you have additional tips & chores, and we’d love to hear about them all! This entry was posted in Birds, DIY, Gardening Tips, Homeowner, Indoor Gardening, Landscaping, Uncategorized and tagged April, Flower garden, Garden, gardening hose, kink free garden hose, Kitchen garden, Plant, TUFF GUARD The Perfect Garden Hose, Twitter, Weed, Weed control. Bookmark the permalink.